Skinchanger who could turn himself into a bear. Though Beorn was a mortal man, he had the power to turn himself into a large black bear, and it is possible that he could turn himself into other things as well. Beorn had multiple homes throughout his life, all of them in close proximity to the Misty Mountains and the River Anduin. Beorn lived in the Misty Mountains before he relocated to the Vales of the Anduin between the Anduin River and Mirkwood. Orcs took over his home, so he moved to a long, low house in the center of several Oak Trees along the Old Forest Road. Beorn had cows, pigs, dogs, sheep, horses, and ponies which were his friends that he never killed to eat. Beorn ate honeycakes, which he had special ingredients for. Beorn was acquainted with Radagast the Brown Wizard, though he did not know Gandalf the Grey. In year 2941 of the Third Age, a Dwarf named Thorin Oakenshield and his company of twelve other Dwarves, a Hobbit named Bilbo Baggins, and the Wizard Gandalf arrived at Beorn's house. They had just slain the Great Goblin in the Misty Mountains and were escaping the Orcs there. Beorn let Thorin's company stay at his house, but was condescending of the Dwarves and interrupted them when they spoke. 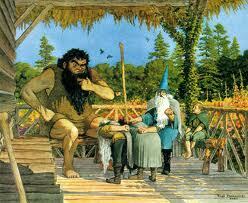 When they arrived, each Dwarf said "at your service" to Beorn, who told them to stop saying that. Beorn also treated Gandalf as though he were unimportant because Beorn had never heard of him before. Nevertheless, Beorn allowed the company to spend the night at his house. That night, Beorn summoned the forest bears to a great meeting. He then crossed the Anduin River and found a Goblin riding a Warg. They informed Beorn that Thorin and Company had killed some of their kin and they were now in their pursuit, though it was not as though the Goblins and Wargs were not trying to kill Thorin and Company in the first place. Beorn killed the Goblin and the Warg and reported back to Thorin and Company. Beorn's prints were found by Bilbo the next morning. The Company then left Beorn's house with several of his ponies. Later in 2941, Beorn fought in the Battle of Five Armies disguised a bear. After the battle was won by the free peoples, Bilbo and Gandalf escorted Beorn to his home where he celebrated Yule and invited many people from miles around. The Beorn and his followers formed a group of men called the Beornings and they settled in Mirkwood and the Misty Mountains. The Beornings became a vicious people who killed any Orc who crossed there path. At some point, Beorn had a son named Grimbeorn. When Beorn died sometime before 3018 of the Third Age, Grimbeorn succeeded him as leader of the Beornings. The name Beorn means "man" in Old English, but it was intended to mean "bear" from the root béo meaning "bee," possibly a reference to bear's stereotypical lust for bee's honey. Beorn also could be derived from bjorn, which means "bear" in Old Norse.